I think it’s clear from the title of the site, I’m more a carb girl than anything else. I’ll happily forgo a piece of steak, perfectly contented with corn on the cob and some artisan bread with Kerrygold butter. After almost six years, Brian still has a difficult time understanding my attitude towards meat. I’m pretty certain I could easily transition to a vegetarian lifestyle if it weren’t for two things: bacon and shrimp. In my opinion, bacon is perfection. On it’s own it’s magnificent, but it is also has the capability of transforming many a mundane dish into something fantastic. When it comes to shrimp – whether they’re sauteed, fried, stuffed or grilled – they top my list of favorite foods. Unless you try to feed them to me in shrimp cocktail form. Then all bets are off. Just something about the ice cold shrimp and cocktail sauce skeeves me out. The preparation of this shrimp dish is super simple – I just toss everything into a zip-top bag and let it marinate in the fridge for about 30 minutes. The shrimp grill up in minutes and are full of flavor. They pair perfectly with grilled asparagus and steamed rice. What’s your go-to, quick weeknight meal? In a large bowl, combine all ingredients except the shrimp and whisk until combined. Add shrimp to the bowl, and stir until evenly coated. Cover, and refrigerate for 30 minutes to 1 hour, stirring a couple of times. Lightly oil grill grate. Cook shrimp on preheated grill for 2 to 3 minutes per side, or until cooked through and opaque. I’m with you on the bacon, but not on the shrimp! 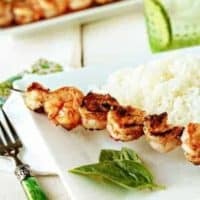 I can’t eat fish but my husband loves shrimp and your marinade sounds lovely, looks wonderful too! I’ll have to make it for him sometime. I looooove shrimp! I never think about it far enough in advance in order to marinate it! Sad! I’ll have to get on the ball with the shrimp I have left. I have to admit, I LOVE shrimp cocktail :). Love the sound of this recipe! I’m with you on the bacon and shrimp, but not the steak! A tender steak, cooked medium well, is one of life’s best food pleasures- right below shrimp. These shrimp look like perfection!! Love how easy too. Our go-to weeknight meal is tacos or sloppy joes. Yes, we are very fancy around here!! We grill year round too. I’m like you – I could go without the protein and load up on carbs but the shrimp sound delicious! I’m a total carbaholic and carnivore. I don’t think I could ever give up anything!! These shrimp look perfect – a wonderful weeknight meal! I’m with you – I could eat carbs, veggies and fruit all day and be content. 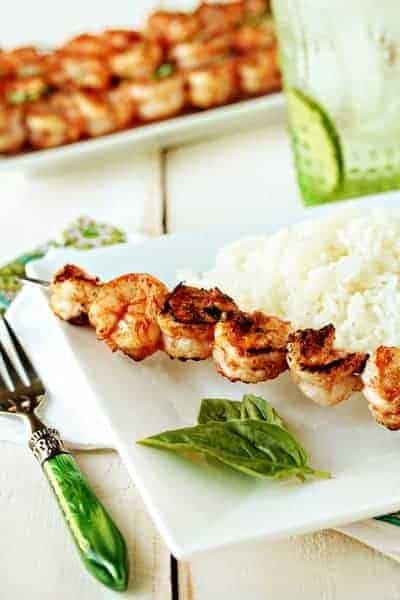 However there are certain meat or seafood dishes that Do It for me and marinated and grilled shrimp is definitely one of them…This looks great! I really wish I liked shrimp because it always look so gosh darn good! Ohh yeah.. I too am a carb girl. But I like steak too. Ahhh who am I kidding, I like ALL food! Love the shrimp and the photo is stunning! I know exactly the person I want to make this for! Thanks mucho, Jamie! I’m totally with you – I could easily be a vegetarian if it weren’t for shrimp, bacon, and also salmon. I’m also with you on hating shrimp cocktail – sometimes I will eat it but only if I grill the shrimps first, so that’s not really true shrimp cocktail anyways! Thanks for sharing the recipe! I would be a full vegetarian if it weren’t for fish in general. Wait, this veggie-fish diet is actually named the pescatarian diet. So I love this simple shrimp recipe. I’ve tried this exact recipe (love allrecipes!) and it’s SO good! Love this simple and fabulous meal! I have yet to grill shrimp at home; I really need to get on that! How beautiful are these! LOVE shrimp…and super easy recipes! We’re totally those people too in the middle of winter! BBQ season is every season! I haven’t had shrimp in such a long time! I really want some now, too bad grilling season is kinda over for here. We often grill shrimp wrapped in bacon, with a little bbq sauce. Yum. Great as an app or main. Shrimp is my favorite dish and yet I rarely make it because I always think I have to make something very fattening (deep fried or buried in a white sauce). It is great to see this wonderful recipe that is healthy as well as delicious. Thanks. Oh I want this for supper, Jamie! Beautiful!!! Thank you for sharing! I’ve linked to it from my site because may of these ingredients are on sale this week and others may be looking for an amazing dish for their meal plan. Thanks again! I tried this recipe on the weekend and everyone loved it! Would definitely do it again and would definitely use it not just as an easy weeknight dinner but also as a nice dinner party option. That’s wonderful to hear! Thank you so much for stopping in to let us know that you enjoyed the recipe. Have a great day and thank you for following MBA! We tried these last night and they were fantastic! I sliced some potatoes, asparagus and carrots; tossed them all with a tablespoon of olive oil and threw them on the grill too. Very hearty and tasty lunch for a chillier day. That sounds fantastic! I’m so happy that you enjoyed the recipe. Thanks so much for stopping in and have a great day! If I leave out the red wine vinegar, will it taste the same? Or what can I replace that with? You could substitute another type of vinegar but it is essential to the marinade. I hope this helps! 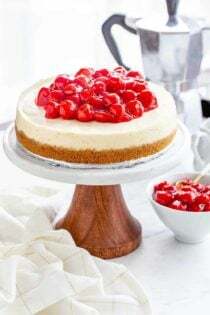 Tried this recipe and my family loved it! They still rave about it and always ask where the recipe is from. Thanks for sharing! You are welcome, Lee! I’m glad everyone liked it!